Last November, Radio One's head of music George Ergatoudis promised on his Twitter account that "Guitar music is definitely on the way back". He gave a more nuanced version of his argument to Digital Spy in January - saying Radio One's audience research showed people are "beginning to tire of the formulaic sounds that make up much of the Top 40 singles chart" but that he doesn't think "we'll see the important guitar acts of this decade really smashing it until 2015." Still, if the man insiders call George Egg-And-Two-Chips says guitars are coming back, it's probably true. And if we're going to have to have planks spanked and strings twanged, I'd like to nominate the Ruen Brothers to do it. They're called Henry and Rupert, but before you write them off as tweed-jacketed toffs reluctantly forced to play "the pop" music to save Downton Abbey, bear in mind they hail from Scunthorpe and would probably do you in a fight. 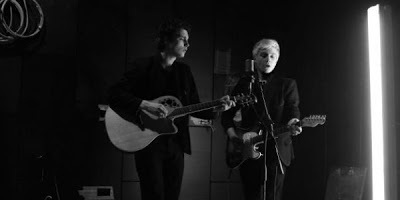 According to their official biography, the Ruen Brothers "write almost everything you hear" (what, even birdsong?) and have been given two enthusiastic thumbs by Paul Gambaccini, of 'someone has died, quick find me a pundit' fame. Black Keys ... then in came the vocals reminiscent of Brandon Flowers.